Kiliii’s mission is to present collaborative new narratives of indigenous culture. He is fascinated by the essential relationship between humans and the natural world. Kiliii’s photography presents an alternative vision of humanity’s greatest wealth—community, culture, and the earth. Hamidah Glasgow: Tell me about the central theme of your photographic work? Kiliii Yuyan: The world is full of stories. Many of those stories repeat what we already know. How many stories teach us to see the world from a truly different perspective? Indigenous peoples are cast as tragic victims of colonization and of climate change. Yet the views from the inside are not ones of despair, but joy. While the dominant cultures continue to gaze at us as they always have, Native storytellers work to offer our own perspectives through modern mediums. The way we work in photography is changing. The colonial gaze is tired. Years ago, I met a young Yup’ik woman who stunned me by confiding, “I wish I was white. I wish I was white.” One day she will see her own people represented in photographs the way she knows them, not the way the outside world likes to think of Native people. That day she’ll understand that the world values her community as modern human beings rather than as problems to be solved. It will teach her to be proud of who she is–and that will make me proud, to be a storyteller and ambassador between worlds. HG: How would you describe your point of view? KY: Native peoples have long had complex storytelling traditions, and not all just oral. My culture, the Nanai, for example, used to create these long picture murals that told epics, which could take days to retell. I think the indigenous perspective is a particular opposition to the colonial gaze because it reflects an entirely different and much deeper cultural perspective. A great way to illustrate this is the reaction to an image of a butchered seal. 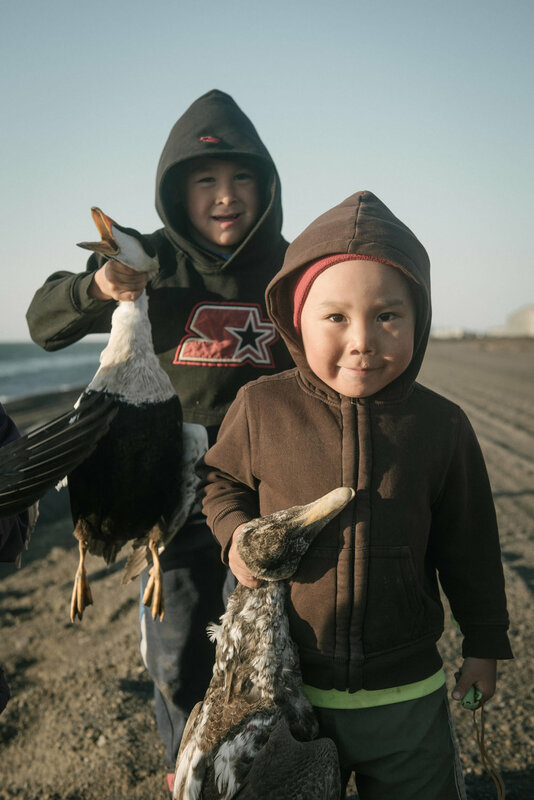 From an indigenous viewpoint, that seal meat is a gift from the seal, and it’s nourishing food. From the colonial gaze, it’s either seen as quaint and exotic or as a repulsive tradition. 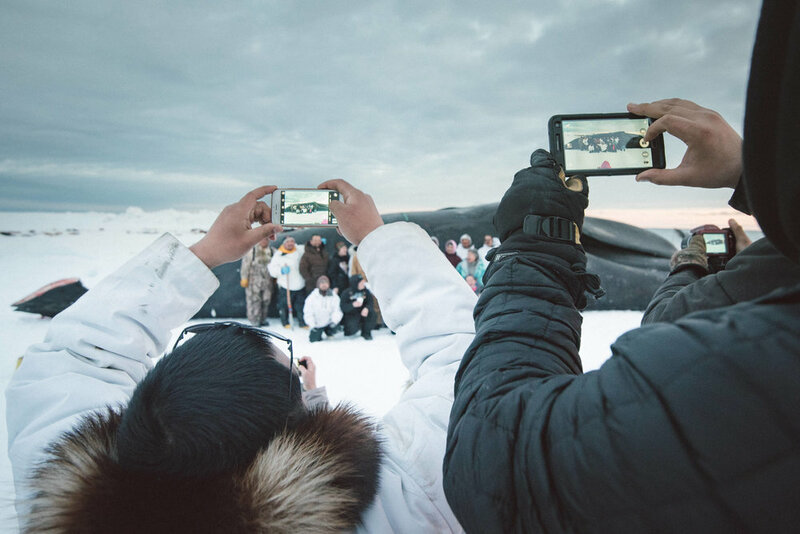 The broader ramifications of this are also severe—thanks to images from colonial photographers, the Canadian seal hunt by indigenous peoples has come under tremendous pressure, and that has destroyed many livelihoods of people in the North. HG: Tell me more about being an ambassador between worlds? KY: I think that for those of us that can serve as interpreters between cultures, we inherit a responsibility to do so. Without cultural ambassadors who can walk between worlds, what we get are knee-jerk reactions to each other. Cultural biases are incredibly strong, and by their nature, invisible. But those knee-jerk responses can lead to devastating consequences, particularly as dominant colonial powers have created the boxes that indigenous peoples are forced to live in. I sometimes love being an ambassador, because when people do listen and are open to overcoming their biases, it’s beautiful and hopeful. It’s often a curse because there is seldom a moment when I’m not wearing one hat or the other. I’m always on duty as a representative, whether I like it or not. HG: What did the young Yup’ik woman understand about being white as preferable? Besides issues of white privilege. How do you see that changing with more Native storytellers advocating and getting the stories out to the larger audiences? KY: That Yup’ik teenager was at a critical time in her life when she was looking at the world and seeing that all the images and ideas of being a beautiful and successful human being involved being white. She came from Bethel, Alaska, where institutional racism against Native peoples is especially strong. In remote communities, the role models and stories you get are from television, magazines, and social media. She told me about her family and her neighbors and thought she was ugly and unlovable. When I pressed her to tell me more, she pulled out her Facebook (this was pre-Instagram) and showed me videos of beautiful women walking the runway, who were all white. Native storytellers are inherently advocates for stories concerning indigenous communities. But more importantly, the stories we tell represent the realities we know. We balance showing indigenous issues like suicide and drug abuse against the stories of our triumphs and joys, such as the power of tradition in the modern world. We work hard to make sure the outside world understands that we are modern people, that we are still around, and that we have to make it work just like everyone else. The other thing is that Native storytellers understand the cultures much more deeply, despite differences in individual communities, which allows us to photograph and show things that outsiders simply miss. An easy example is images of ceremony. Outsiders often go after showing images of ceremony, not understanding that the general rule is that most ceremonies cannot be photographed. On the other hand, much of the most profound spirituality goes unseen because it’s not a part of ceremony—just as with other traditions, spirituality is often individual and not immediately evident without the proper context. One of my favorite photographs is one of Iñupiaq Flora Aiken spreading her arms out as she walked over to a harvested whale—a sign of giving thanks to the whale for its gift to the community. It’s something I’d seen only on a few occasions, but I instinctually knew that it was significant, and worked hard to capture it. Later, I learned what her gesture meant, but I’ve never seen it since. HG: What was your response to the young Yup’ik woman? KY: I was speechless for a long time. Ultimately, the best I could do was to continue my job, which was teaching her the indigenous art of traditional qayaq (kayak)-building. 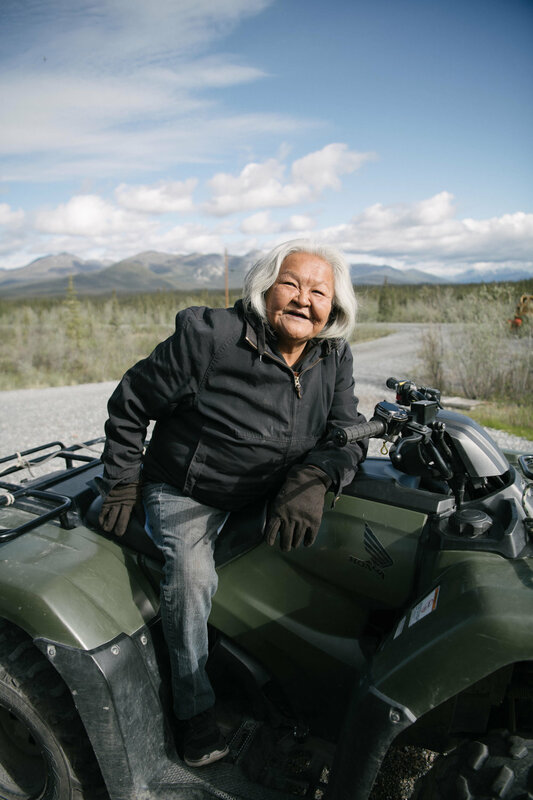 When she was working on the qayaq, those moments of identity crisis were sidelined, and she got to be proud of herself for doing something amazing that came from her own culture. I’ve thought a lot about her since then, and recognize that in much of photography work, I’m doing it for her. HG: You’ve described your work as an outsider/insider perspective. Please tell me more about that position and how that works? KY: This is something I like to stress. I may be Native, but I’m still always an outsider whenever I’m not working within my own communities. Indigenous peoples are incredibly diverse, with thousands of languages and different ways of seeing the world. The difference between the Sarawak in Borneo and the Sami in Norway is far more than a Malaysian fisherman and a Norwegian one. Yet, for all our cultural distinctiveness, there is a distinct thread that binds indigenous communities, because we all have evolved in concert with the land. Our connection with the land, with family, and with tradition are what make us indigenous. It’s impossible to ask every community to tell its own story. But right now, nearly all the stories come from what is essentially the dominant culture, the colonial viewpoint. I think it strikes a good balance to have specialized storytellers that are much closer to the communities they are describing. Aside from having a better intuitive sense about indigenous issues, we also are much more inclined to work collaboratively with the communities themselves. Indigenous communities have a completely different sense of permissions. In the dominant culture, you can just swoop in, take some pictures or write a story, and then leave. For indigenous storytellers, we are held to a different standard, and responsible for telling not just the story we want to tell, but the community’s notion of itself as well. It’s a negotiation, a dance we do to interpret a culture for others while removing as many cultural blindspots as we can. KY: The bulk of what creates an indigenous culture is responses to the land and living within it. The Sarawak are a jungle people and must know the tens of thousands of other species intimately—what they can eat, how the jungle’s seasons affects the ecosystem. The Sami, on the other hand, must know a lot specifically about one species—reindeer, because their culture revolves around that. But both these cultures evolved in the absence of globalization—their clothes, language, customs, food have been very different for thousands of years. A Malaysian fisherman and Norwegian one, on the other hand, both share many common points because of globalization. Their jobs are both based on a market economy, and their clothes are made of the same materials, their boats use the same engines and require the same type of knowledge to repair. Their ways of interacting with the world have been converging for much longer than indigenous cultures, for the most part. HG: There is a long answer to this, but I’d like to hear your shorter response to the issues surrounding National Geographic’s history and their current efforts to right that history? KY: National Geographic has been really public in acknowledging its history of colonial perspective, especially with the 2018 issue dedicated to addressing this. I won’t go into that, because it’s a conversation that’s going to keep happening for a long time. At a smaller scale, I will say that I’m quite inspired by what individual Geographic editors are doing. They’re hiring people like myself that are much closer to the issues being covered, and asking us to pitch stories and generally chart a course into brave new territory. Even so, my editor Jennifer Samuel said to me, “It’s just a big ship, and it takes time to turn no matter how hard we steer.” And that’s absolutely true. As staff retire or move on, they are replaced by a more diverse group of talent that are actively advocating for new perspectives and hiring people who can bring those perspectives to the magazine. HG: How would you summarize the problematics of National Geographic’s photographic history? This point is vital for photographers that travel to other countries and make pictures of people’s and cultures with the goal of creating images like the ones they see in Nat Geo. KY: For the last century, National Geographic has been showing images predominantly made by white men, which means from only the dominant colonial point of view. The problem that results is that only what interests and concerns photographers from the dominant culture gets shown. Their interpretations of the world have their values embedded inside. One easy example is the idea of exploration. National Geographic has long championed ‘explorers’ who are the first to set foot in a certain place and plant a flag there. But the explorers always missed the presence of indigenous peoples that had been already living there for thousands of years. HG: How does being half Chinese impact your insider/outsider position? KY: I like to think that it informs and helps is me in my work because I’m highly aware that I’m part colonizer and part colonized. The dynamic of being from a family that is both are complicated and full of tension and subtle racism. Growing up in all of that was hard because as a kid I didn’t understand any of it. But now I can always look back at my childhood, and it gives me more empathy and understanding for both indigenous peoples and even those from colonial societies. It’s easier to take an uncompromising stance when you have had nothing but suffering, but I’ve had a lot of privilege as well. It’s good to be reminded of that privilege. It helps me to walk the line as an ambassador between cultures. In addition, China continues to be a colonizer today. I can see echoes of what happened to my own family in what’s happening now in Western China with the Muslim peoples, and that gives me a feeling of responsibility to report on the ongoing colonization there. HG: What are your hopes for the future of the Native storytellers? Both in photographs and in the stories that are told and make their way to a mainstream audience? KY: I think this idea is something that inevitably becomes a big part of my life’s work. I can’t help but see things from an indigenous perspective, of course, but paying attention to how that is different from the colonial gaze will become almost subconscious. As a result, anytime I notice something and then internally note that my interpretation is probably different from that of mainstream society, I’m drawn to photographing it. I want to share how I see the world with mainstream societies. I personally believe that indigenous cultures have a way of seeing the world that would be greatly beneficial to all humankind. Many of the things that indigenous peoples hold dear are becoming less and less the values shared by the outside world, as it becomes more urban and more individualistic. Exposure is perhaps the most powerful way to change people’s worldviews. HG: Thank you for taking the time to chat with me. I look forward to showing your work in the fall of this year through The Center for Fine Art Photography at the Museum of Art, Fort Collins.